https://matcha-jp.com/en/6394 Where To Stay In Kansai - 6 Great Guesthouses In Osaka, Kyoto, And Kobe! Guesthouses are an affordable way to enjoy Japan travel. We introduce six guesthouse lodgings where travelers can experience local life and have a great time in Osaka, Kyoto, and Kobe, in the Kansai area (Western Japan). Stay at Guesthouses for a Memorable and Affordable Trip! Guesthouses are a popular option for visitors wanting to travel to and around Japan at a reasonable price. Let’s take a look at six recommended guesthouses in the Kansai area, including the areas of Osaka, Kyoto, and Kobe. You are sure to have a fantastic trip at these guesthouses, which range from lodgings where you can experience local lifestyle to convenient accommodations where you can base your trip around. If one of these guesthouses seems interesting to you, please refer to its respective article! Lodging & Kin is a seven-minute walk away from Tsutenkaku, making it a very convenient base for your sightseeing activities in Osaka. You can feel the warmth of the wood of the guesthouse, which creates a mountain cabin-like atmosphere. During the day, the living room is used as a lounge area by guests, but it becomes a bar at night! Guests staying the night as well as other customers can come into the bar. Enjoy relaxing and reading a book, or chatting with the other patrons. You can spend your time however you want in this laid-back, comfortable atmosphere. The rates for the co-ed dormitory room start at 3,500 yen (all rates include tax). You can also stay in a double room (8,500 yen) for two people, or in a Japanese-style room for families and groups of friends (starting at 8,500 yen). The guesthouse is fully stocked with amenities, and shampoo and body soap is free. You can also purchase towels and toothbrushes here. If you’re interested in encountering everyday life in Osaka, Guesthouse Mokumoku is the place for you. Guests here can use Showayu, a well-known public bathhouse, as much as they like, as the guesthouse owner operates both. There are seasonal baths like yuzu citrus and lemon, as well as cypress-scented baths. You can also try special baths during events, so you can have an entertaining visit each time you go. At this guesthouse, there is also mogumogu, a shared kitchen where you can bring in food and drinks, which you can buy at the nearby shopping street. Why not have a drink after your bath? There two types of rooms: dormitory rooms and private rooms. The coed dormitory rooms are 3,500 yen per night (tax included) and women-only dormitory rooms are 3,800 yen per night. Menu/Pamphlets in Other Languages English signs are available. Nearest station Awaji Station of the Hankyu Railway. Access Three-minutes walk from the Awaji Station. Price 3,500 yen to 10,000 yen. Khaosan Kyoto Guesthouse is in Kyoto, near the downtown areas of Kawaramachi and Gion. We recommend this guesthouse for people who want to enjoy both shopping and sightseeing. This guesthouse is so well-regarded that it has won hostel awards, and the interior is pristine. The prices are also very reasonable. Nightly rates for the dormitory start at 2,000 yen (prices vary depending on season). In addition to dormitory rooms, there are twin rooms, double rooms, as well as triple rooms and family rooms. The dormitory rooms have lockers so you can feel secure. Khaosan’s low rates and clean, secure rooms are the reasons behind its popularity. There is also a living room (pictured) where guests can relax. You can watch television and DVDs, or play the Nintendo Wii. You might even make some new friends among your fellow guests. Guesthouse Maya, which opened in Kobe in 2017, is based around the idea of experiencing everyday life in the city. Here you can wake up in the morning and get breakfast at a nearby bakery. In the afternoon, head to Mt. Maya to ride the cable car and take a mountain stroll or walk to the nearby Oji Zoo and the Suidosuji shotengai (shopping street). Go to a classy bar to enjoy a few drinks, and relax at the end of the day at a public Japanese bathhouse. You can experience everyday Kobe life just like the locals do. There are single rooms, double rooms, rooms for groups of 2-4 people, and dormitory rooms for groups of six. Coed dormitory rooms start at 3,300 yen a night, and women-only dormitory rooms start at 3,500 yen (rates including tax). The Minato Hütte guesthouse is very accessible, as it is just a few minutes away on foot from Sannomiya Station, Kobe’s central hub. The bar on the first floor, designed to look like a cabin, is also popular with local residents. 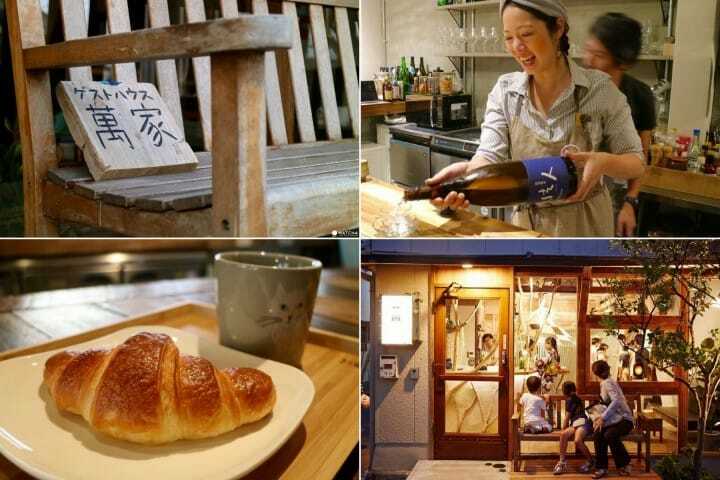 At this guesthouse, you can enjoy Japanese craft beer, sake and various other alcoholic beverages. The second and third floors are patterned after the ocean. Various decorations, such as the buoy placed in a corner of the landing, show off the guesthouse’s playful spirit. Coed dormitory rooms start at 3,000 yen a night, and women-only dormitory rooms start at 3,200 yen (rates are including tax). There are various other thoughtful features provided throughout the guesthouse. You can borrow a bath set when you want to go to the nearby public bath house, and there are free amenities as well, such as indoor slippers and sandals for the outside area. Yume Nomad is a guesthouse in Shinkaichi which retains the area’s working-class vibe. Shinkaichi is an area with great access to Sannomiya and Motomachi and many places to eat and drink, with budget-friendly restaurants where you stand as you dine, serving udon and other delicious dishes, dining halls and other places that you can only find in a working-class neighborhood. If you want to visit tourist spots but also experience a truly local vibe, Yume Nomad will grant both those desires. The Yume Nomad Cafe and Bar is a lounge area on the first floor where you can relax by yourself or with friends. It’s a good place to plan your trip or mingle with other guests. There are dormitory rooms and private rooms. Via online reservation, dormitory room rates start at 2,100 yen a night. Women-only dormitory room rates start at 2,500 yen a night (both rates include tax). Enjoy A Retro Kobe Vibe At The Artsy Yume Nomad Hotel! Make the Most out of your Trip with a Guesthouse Stay! Did any of these places strike your fancy? At guesthouses, you can pay reasonable rates to experience life as though you live in that area. Stay at them and have a fulfilling adventure in Japan!